Yesterday, after pulling invasive weeds on the Overlook Trail, I found a tick lodged in the inside of my arm. So today, as soon as I got home from my session of weed pulling, I stripped and inspected myself before heading to the shower. I was shocked to find that another was attached to my side. It had apparently bit me before I even had a chance to find it. I was out for about an hour-and-a-half. Luckily, I hadn’t yet mailed my envelope to the Sonoma County Department of Health Services to test the first tick for Lyme disease, so I added it to the envelope and doubled the check (they charge $33 to test a tick). 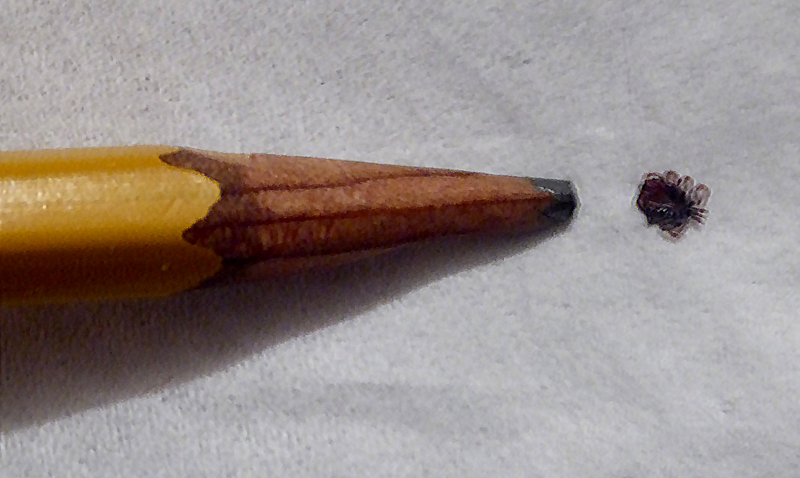 Part of the problem is that these buggers are quite small (see the picture of my first tick). That means when scanning for a tick on your clothing or body, you need to look for a very small, essentially black dot. Also, my work takes me off the trail into the vegetation, which most hikers and runners have no need to do (so my story isn’t necessarily indicative of the actual danger). In a weird confluence of events, I found the first tick while in the quarterly meeting of the Sonoma Overlook Trail Stewards. I discovered that my arm was sore, and I couldn’t figure out why that would be, so I looked at it, and found the tick. Thankfully I never go anywhere without my Swiss Army knife, so I ducked out of the meeting and extracted it with the tweezers. I wrapped it in a tissue for safe keeping. Avoid touching or brushing against vegetation. Inspect yourself and others for small black dots. Tuck pants legs into your socks. I made a couple signs to this effect to put at the entrances to the Overlook, and will make another two for posting on the Montini. In my ignorance, I hadn’t realized that ticks would be out by now. Richard Dale, of the Sonoma Ecology Center, told me at the Stewards meeting that they have been out for a couple of weeks. In the future, I hope to be better about warning people of the danger as soon as it becomes real. Even I could have used the warning. Stay safe out there, hikers and runners! 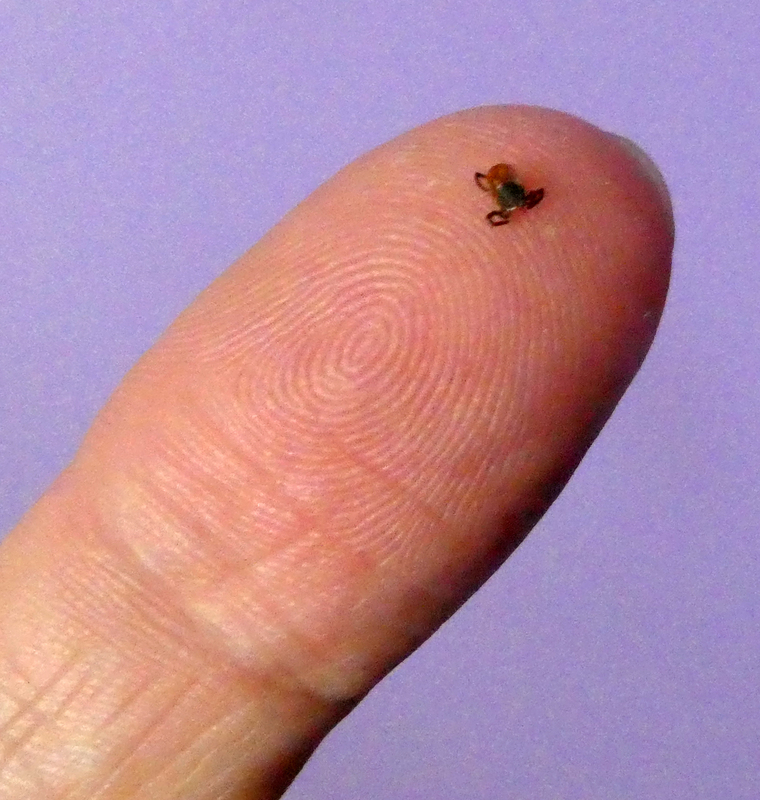 Yesterday I pulled a tiny tick off me (see photo), sadly not before it had bitten. Now I have a sore and swollen red spot on my back, and I’m on the lookout for any signs of Lyme disease. That is a serious disease that needs to be caught early to have any chance of avoiding potentially serious consequences. A study in the 1990s found that the Western Fence lizard, which is plentiful on both the Overlook and Montini properties, has an enzyme that can essentially cure a tick of transmitting Lyme disease. However, a study in 2008 found that after removing the Western Fence lizard population from a plot of land, the number of ticks went down as well, as most of the young ticks could not find another host. So although the later study did not negate the findings of the earlier one, it does point out the complexity of the interactions of various populations and these effects on the spread of disease. All of that is perhaps just a long-winded way of saying — be careful! Check yourself and others after hiking on the trails. Believe me, you don’t want to be me. In Northern California, despite the current cold snap, we have essentially entered Spring. This means several things. Plants like poison oak are flourishing, sending tendrils out to conquer new areas. We are presently trying to cut this back from the trail. Soon we will also need to watch out for ticks, which are particularly bad early in the season, from March to mid-May. Ticks can carry Lyme disease, so it’s important to prevent the little buggers from biting you. Wear long pants and inspect yourself after your hike. If you do get bitten, then watch the bite carefully for signs of Lyme disease, as early treatment by a medical professional is essential. Thankfully, we have the Western Fence Lizard to help us out, since when a tick bites that lizard an enzyme is transferred to the tick that cures the Lyme disease. This has led to a much lower incidence of Lyme disease than in other areas without this helpful lizard. So be kind to the Western Fence Lizard! They are already scurrying across our trails. Another hazard to watch out for is rattlesnakes. 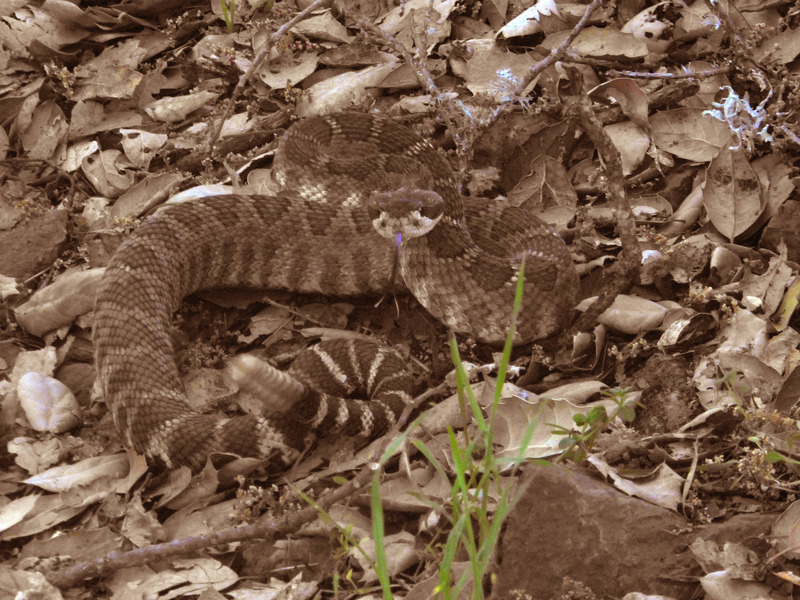 Rattlesnakes emerge from hibernation in the Spring when the days become warm enough for cold-blooded reptiles. I’ve already seen the Western Fence Lizard scurrying across the trail, which means snakes will not be far behind. However, this recent cold snap has sent them to ground. But rattlesnakes are typically around from March to September, so we are entering the time when they will be coming out of hibernation in the lowlands and making their way to their higher hunting grounds. Since they will be on the move, most of my sightings of rattlesnakes tend to happen in the Spring. So stay alert and safe out there! If you like flowers, then now is the time to hike the Overlook and Montini trails, as they are going nuts. 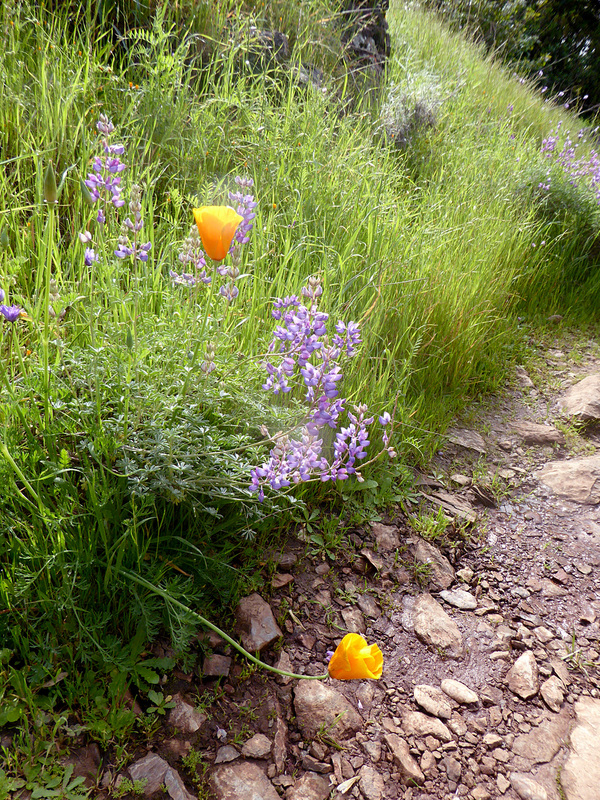 From California poppies, to Lupine, to you name it, they are out in great profusion. The picture to the right was taken just a few days ago on the Overlook Trail, where you can see both Lupine and Poppies hanging over the trail. There are many other flower varieties out at this time, and others on their way. Spring is in full flower, and it is awesome. However, keep in mind that other plants are going crazy right now, and among them is poison oak. Although we recently cut it back, it is still growing and we will likely need to cut it back again soon. Also, since the grass is growing like mad and often over-hanging the trail, keep an eye out for ticks. They like to climb up onto the tips of grasses where wildlife (and we count) are walking by so they can hitch a ride. For tips on what to do if you are bitten, see this earlier post where I describe my own experience. But by and large, it’s all good out there on the trail, and experiencing our wildflower bloom is well worth any slight risks. Yesterday, likely due to my work in cutting back poison oak on the trails, I found a tick on me. Freaked out by the possibility of contracting Lyme disease, I quickly found a pair of tweezers and pulled the tick out, trying carefully to grab it from the head rather than squeezing the body. It was difficult, as it was quite tiny. The bite spot is still red and sore. But the important piece of information is this: save the tick, so it can be tested for Lyme Disease. But as this Press Democrat article points out (helpfully published the day I found the tick), the actual incidence of Lyme disease in Sonoma County is not high, despite the fact that we have had the most reported cases in California in recent years. Use repellents that contain 20 to 30 percent DEET on exposed skin and clothing for protection that lasts up to several hours. Treat clothing and gear (boots, socks, pants, tents, etc.) with products containing 0.5 percent permethrin. Bathe or shower as soon as possible after coming indoors, preferably within two hours. Conduct a full-body tick check; parents should check children under arms, in and around ears, inside belly button, behind knees, between legs, around waist, especially in hair. 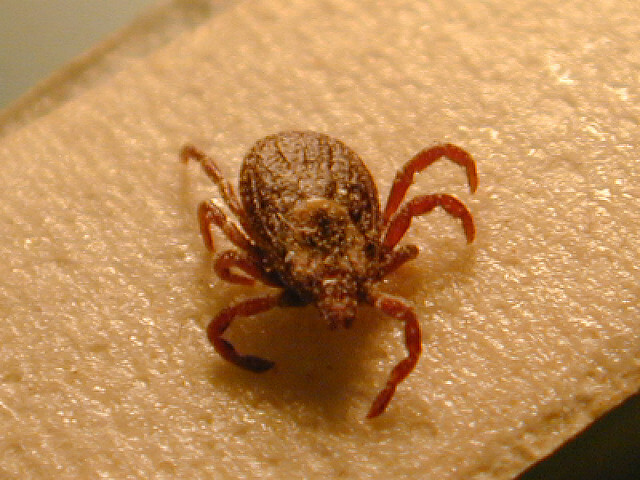 Examine gear and pets, which can bring home ticks that will then attach to a person. Tumble clothes in a dryer on high heat for up to an hour to kill remaining ticks. Remember that ticks that carry Lyme disease can be very small — about the size of a poppy seed. The biggest danger comes when the tick bite goes undetected and the disease is allowed to fester without antibiotics to fight it. Long-term effects are possible in these cases. Rash. From 3 to 30 days after an infected tick bite, an expanding red area might appear that sometimes clears in the center, forming a bull’s-eye pattern. The rash (erythema migrans) expands slowly over days and can spread to 12 inches (30 centimeters) across. It is typically not itchy or painful.Erythema migrans is one of the hallmarks of Lyme disease. Some people develop this rash at more than one place on their bodies. If these symptoms are not spotted or recognized, later signs may appear in the following weeks and months. See the Mayo Clinic web site for more information. So stay safe out there, and be vigilant!